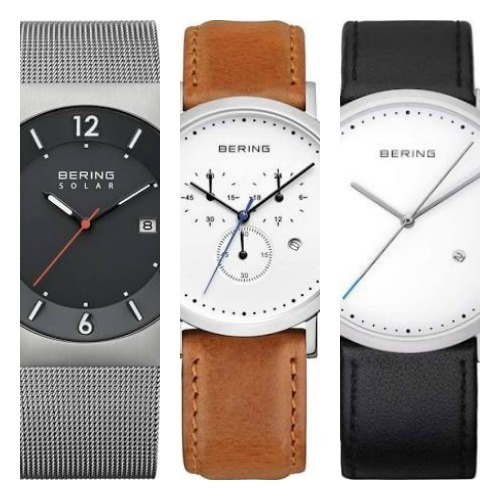 Hey everyone, today I thought it would be cool to take a look at some of the best simplistic men’s watches available from Bering. This is a brand that featured heavily in our 100 best minimalist watches for men list that I wrote recently. 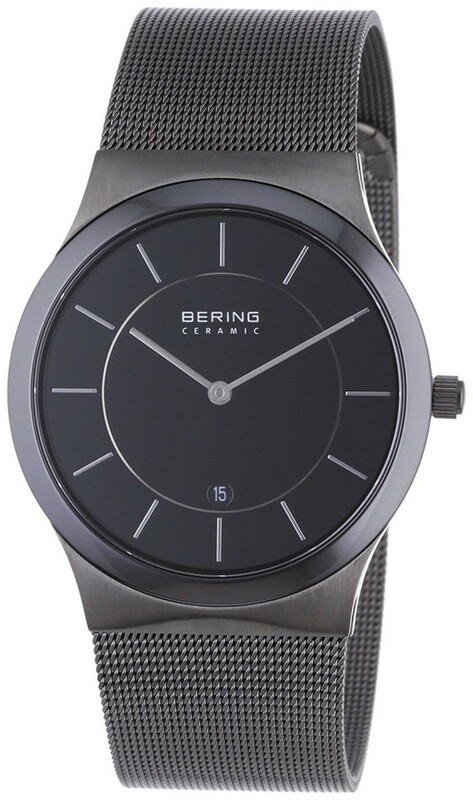 Bering are a popular brand that focuses on sleek innovative and modern design. They have a large collection of watches available for men and women that are perfect for making a fashion statement with. They often feature a combination of smooth lines and curves with a focus on minimalist design. I think Bering watches offer some pretty good value for money in general. When compared with the other brand options in this price range I’d place Bering among my favourites. 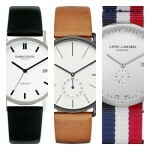 Below I have a selection of simple, plain, cool men’s watches with a focus on dial design and style. This is just a small example of what can be found from a brand like Bering. If you have any questions about any of the watches featured in today’s list just comment below and I’ll try and get back to you as soon as I can. For now, enjoy today’s list. 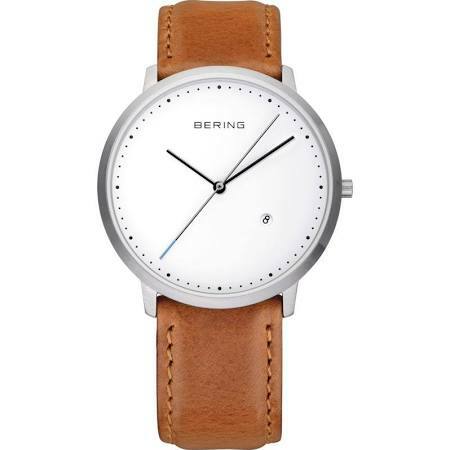 First up on our list of the best simplistic watches for men from Bering is this minimalist elegant timepiece. 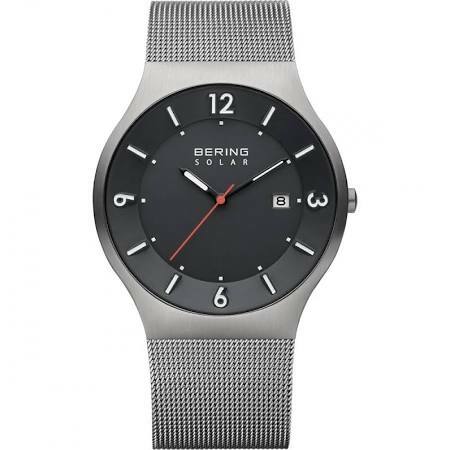 This popular Bering watch features a stainless still casing that has a 39mm casing diameter and a slim 7mm depth. This makes the Bering brand ideal for people looking for thin watches like Skagen. This watch has been fitted with a soft genuine leather strap and fastens with a buckle style clasp. The dial features this simple minimalist design with slender silver coloured hands with small black dots making the hour and 15 minute increments. You’ll also spot a small date display on the white dial which may come in useful for some. There has been a small dash of colour added to the dial with the tip of the seconds hand finished in a soft blue, this is something I actually quite like on this watch. Powering this men’s cool watch is a Japanese made quartz movement for reliable and accurate timekeeping. It also has a strong sapphire crystal glass for excellent scratch protection, as well as a 30m water resistance rating. You can read my full 11139-404 Bering watches review here soon. Next up on our list of the most popular plain watches from Bering is this interesting solar powered timepiece. It’s built with a 40mm stainless steel casing that has a 9mm thickness. Paired up with this is a grey stainless steel mesh style bracelet that fastens with a jewellery style clasp. The dial is in black and decorated with small white baton style hour markers and numerals marking the 3 6 9 and 12 points. There’s also a small date display located at the 3 o’clock position on this Bering dial. The hands have a small coating of lume making them extra visible in dim lit conditions. This Bering simple men’s watch is powered by a solar movement. These use light to charge themselves up and never require a battery. No battery is required and they can store up to 6-12 months worth of power reserve. This men’s Bering watch also features a high quality sapphire crystal glass for brilliant scratch protection and has a 50m water resistance rating. You can read my full 14440-077 Bering watches review here soon. In at number 3 on our list of the most popular Bering simple men’s watches is this interesting minimalist chronograph timepiece. This watch features a larger 40mm stainless steel casing that has a 9mm thickness. It’s been paired up with a comfortable genuine leather strap that fastens with a buckle style clasp. The dial has a very minimalist design to it with an open white coloured dial that features small black dots around the outside to mark the hours and 15 minute intervals. There are 3 small chronograph sub dials on display as well as a handy little date function. They’ve gone for a dash of colour with the use of a red seconds hand. A reliable and accurate Japanese quartz movement powered this cool chronograph watch. It also features an excellent sapphire crystal glass and 50m water resistance rating. You can read my full 10540-404 Bering watch review here soon. 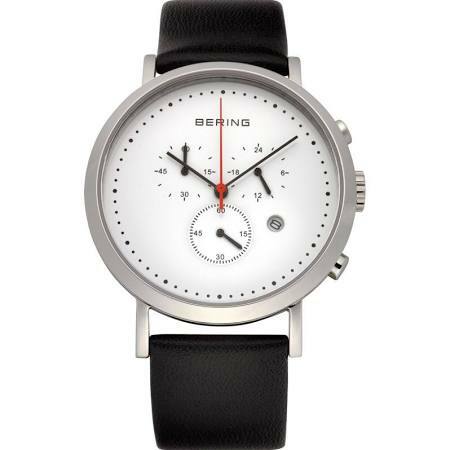 The next men’s simplistic watch on our list is this beautifully designed minimalist chronograph Bering watch. This timepiece has a nice big 40mm stainless steel casing that has a thickness of 9mm. It’s been paired up well with a soft light brown genuine leather strap that fastens with a traditional buckle style clasp. The dial features these small black hour and 15 minute markers which are commonly found on a few minimalist Bering watches. There are also 3 chronograph sub dials and a small date function on display. They’ve gone for a small touch of blue colouring with the use of the seconds hand which I think adds a nice touch to the design. You can read my full 10540-504 Bering watches review here soon. 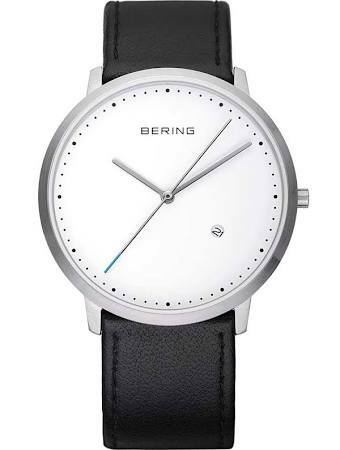 Here we have a popular men’s Bering ceramic watch. This is built with a stainless steel 40mm casing that has a 7mm thickness. A ceramic bezel covers the casing giving the front this two tone finish between the brushed stainless steel and ceramic bezel. This has been paired with a stainless steel plated mesh style band that fastens with a fold over jewellery style clasp. The dial has a simplistic finish to it with these slim baton style hours markers on an otherwise sparse black dial. The only extra detail that’s been included is a small date display at the 6 o’clock position. Powering this simplistic watch is a reliable quartz movement that offers accurate timekeeping. Extra features include a sapphire crystal glass and a 50m water resistance rating. When it comes to men’s plain watches I’m a big fan of using ceramic in the design. You can read my 32239-342 Bering watches review here soon. 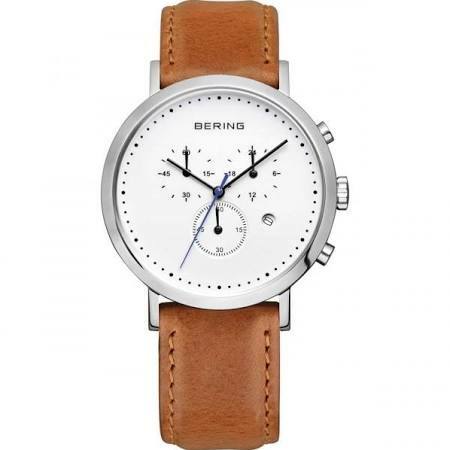 Last but not least on our list of the best plain watches for men by Bering is this stunning timepiece. It’s a classic Bering that’s built with a 39mm stainless steel casing and has a thickness of 7mm. This is a slim men’s simplistic watch that’s been matched up with a soft genuine leather strap in a light tan colour. I’m a big fan of this minimalist dial with the dots around the outer part marking the hours and 15 minute increments. The hands have a slim finish to them in black for the hour and minute with the seconds in silver with an added light blue touch on the end. There’s a tiny date display also found on the dial which I like the look of. At the heart of this men’s plain watch is a reliable quartz movement for accurate timekeeping. This model just like the previous ones also features a sapphire crystal glass and has a 30m water resistance rating. You can read my full 11139-504 Bering watch review here soon. Thanks for taking the time to read through today’s list of the most popular Bering simple watches for men. What was your favourite model featured today? Comment below and let us know. 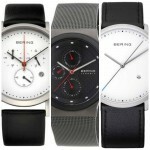 Top 5 Most Popular Bering Men’s Watches. Great Value For Money.